Can a Felon Become a Mortician? Many felons find it quite challenging to get a job after being released from prison. There are resources available even though felons may not believe anyone will hire them. Those who have hired felons have learned that they make good employees, but it might be in a different career from one felons had prior to their conviction. 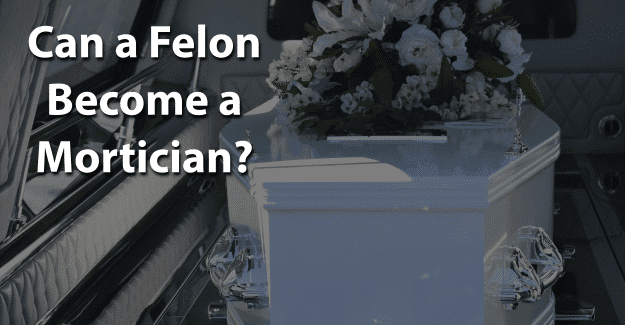 This blog post will address the issue of whether or not a felon can become a mortician. What Education/Training Does a Mortician Need? How Much Does a Mortician Earn? A mortician, also known as an undertaker or funeral director, is in charge of coordinating the funeral process. This includes preparing the body for burial or cremation (embalming), making arrangements with families, and overseeing funeral details. A mortician also helps with the planning of the funeral and guides the deceased’s family and friends through the process. He or she also helps with all activities of the funeral including finding a minister, coordinating transportation of the body, and making sure the obituary is properly placed. A license to practice as a mortician is necessary, but the requirements vary by state. Generally, an applicant needs to be at least 21 years of age, accumulate a certain number of credits in mortuary science courses at an accredited college, complete an internship, and pass the approved national licensing exams. The exam includes business law, psychology, funeral service merchandising and history, microbiology, pathology, restorative arts, anatomy, and embalming. There is a total of 58 mortuary science schools accredited by the American Board of Funeral Service Education (ABSFE). Most of these schools are two-year associate’s degree offered at community colleges, although some also offer bachelor degrees. According to the U.S. Bureau of Labor Statistics, there were approximately 54,400 practicing morticians in the U.S. in 2016. The median salary for morticians was $54,830. This is the salary at which half of morticians earn more and half less. A mortician’s salary will vary by state and whether it is in a rural or urban environment. In general, a mortician tends to make more in the Northeast and in large cities. With the baby boomers coming near retirement age, there will be a massive group of US citizens who will need healthcare and potentially funeral services. Experts project a 5% increase in mortician jobs by 2020 due to the aging population, as about 2.5 million people die each year. A felon can pursue any degree he or she wants. Approximately 60% of colleges consider criminal history in their admissions process, although there is no standard policy regarding a background check. Any felon that wants to get a degree can find a college that will accept him or her. The challenge is in getting a job as a mortician following graduation and certification. It is important to be honest in filling out an application for a job or when applying for certification as a mortician. If a felony isn’t disclosed but is found on a background check, this constitutes fraud and is punishable by jail time. It is a crime to falsify an application, which could result in being sent back to prison. In order to be successful as a mortician, it is essential for felons to be honest about their background. They are already seen as being dishonest, untrustworthy, and unwilling or unable to follow directions from authority figures. Having their record expunged can give them the chance they need to begin with a clean record and succeed in becoming a mortician. Expunging a criminal record allows anyone to honestly state on an application that he or she has not been convicted of a crime. It is a major challenge, but it might be worth it for a felon wanting to become a mortician. Giving him or herself the best chance for success by having his or her record expunged and also documenting any training programs or additional education could make a critical difference. What do you think about this blog post? Are you or someone you know been in the situation of trying to become a mortician with a felony? What was that like for them, and how did they achieve success? Please tell us in the comments below.